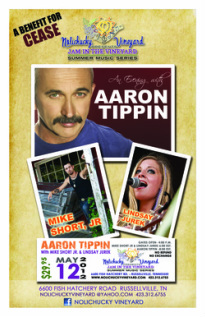 There is an upcoming charity concert with Aaron Tippin that you need to know about. The event is hosted by Nolichucky Vineyard and the lineup includes Mike Short, Jr. and Lindsay Jurek. Funds that are raised will help CEASE make repairs to their shelter for victims of domestic violence. The benefit concert with Aaron Tippin promises to be a terrific night out for a terrific cause. General admission for the CEASE benefit concert with Aaron Tippin is only $29.95. Even a VIP admission ticket is an affordable $50. This gets you a VIP Backstage Pass and Meet and Greet with the performers. It also includes VIP seating and wine tasting (over age 21). Your biggest bang for the buck comes with the purchase of a $100 sponsorship ticket for the CEASE benefit concert. The purchase of this ticket gets you a cool Sponsor Backstage Pass, sponsor seating and Meet and Greet. (How cool will it be to shake hands with Aaron Tippin and the other performers!) Plus, it includes heavy hors d'oeurves and a wine tasting (for those 21 and up). 4:00 pm to 11:00 pm. Nolichucky Vineyard in Russellville, Tennessee. The concert with Aaron Tippin is more than a fun evening. It helps victims of abuse have a place to stay. CEASE provides support to victims of domestic violence for a six county region in East Tennessee. Other services include a hotline, counseling, advocacy, support groups and more. One of the finest songs by Aaron Tippin is You've Got To Stand For Something. Stars get bombarded by requests for help every day and he is to be commended for choosing to stand by CEASE. He, and the supporters who are named here, are standing up so victims of domestic violence will have a safe place to stay. Will you stand up too? I am familiar with CEASE through my day job and am proud to vouch for the work they do. Statistics from the Tennessee Coalition Against Domestic & Sexual Violence (TCADSV) suggests that Tennessee ranks #5 on the list of domestic violence homicides. Organizations like CEASE are working to change those numbers. Fighting domestic violence is impossible without help from the public. That's why the CEASE benefit concert with Aaron Tippin is important. You may have benefited from their labors without realizing it. This organization raises awareness and educates the public to lower the rate of domestic violence in the area. Supporting CEASE now is an investment in the future for everyone. I hope that you stand with Aaron Tippin and the others by supporting them. Read more about the CEASE benefit concert with Aaron Tippin on the Claiborne Progress.